The Rena L-350 Tabber Machine is a classic jack-of-all-trades. With a proven design that has years of field experience, this unit will run for a long, productive time. 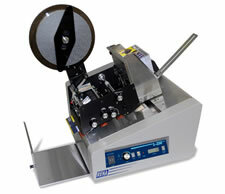 It runs clear, translucent and paper tabs at speeds up to 25,000 per hour on a typical tri-fold mailer. The new control panel design and professional grade color scheme allow the Rena L-350 to look good in workshops, warehouses, mailrooms and office environments while requiring less maintenance. With new postal regulations for tabbing and the skyrocketing cost of postage meter supplies, this sweet machine can really make your day.